Flossing your teeth nightly. Exercising regularly. Meditating daily. These are helpful things to do. Though, many of us don’t want to do any of them. The question remains: Why is it so difficult to begin and keep a good habit? At the end of my recent meditation retreat, the teacher mentioned that many people go on long, silent retreats every year and meditate for hours a day but fail to maintain a daily practice once they get home. It’s true: One of the hardest things about meditation is doing it…regularly. While there’s no shortage of advice on behavioral change, the crux of beginning and keeping a good habit might be much simpler than we think. One approach: Take the smallest step possible in the direction of your goal. “Radical change is like charging up a steep hill—you may run out of wind before you reach the crest, or the thought of all the work ahead makes you give up no sooner than you’ve begun,” writes Dr. Robert Maurer, a faculty member with the UCLA School of Medicine and author of One Small Step Can Change Your Life: The Kaizen Way. Maurer argues that our brains hate change and, in fact, feel threatened by it. Setting big audacious goals can block rather than pave the way to good habits. 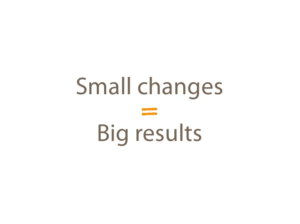 On the other hand, making a small commitment to change turns off the brain’s fight-or-flight response and lowers resistance. Repeatedly taking small steps toward change creates new connections between neurons to support a new habit. It also builds confidence. Maurer relays an example of a former client named Julie who had difficulty exercising regularly. Instead of advising her to join a gym or sign up for a 5K, Maurer told her to march in place for a minute while she watched television every night for a week. That small, seemingly meaningless commitment changed Julie’s attitude toward exercise. Her enthusiasm snowballed and over time she developed a lasting exercise habit. So, try flossing a single tooth before bed. Do one push up. Rather than meditating daily for 30 minutes or more, do so for a minute. After a week, see if you can increase it by a minute more or meditate for a minute several times a day. Even a few minutes of silence and solitude (see below) can be mind altering. • Or Arianna Huffington’s interview with Tim Ferriss. https://tim.blog/2017/10/18/arianna-huffington/ After collapsing from exhaustion, Huffington retooled her life and founded Thrive Global, a company dedicated to health and wellness information. “I’m a big believer in micro-steps,” she tells Ferris. One day, 20-year-old Chris Knight drove his Subaru Brat to the edge of the Maine woods, tossed his keys onto the center console and walked into the forest. He wasn’t seen again for another 27 years. 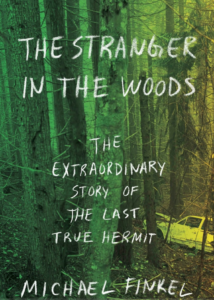 Michael Finkel’s page-turning book about Knight; The Stranger in the Woods: The Extraordinary Story of the Last True Hermit, is a fascinating peak into the mind and the odd life of a man who feels more comfortable alone than with people. But it’s also a thought-provoking reflection on solitude. Research shows that kindness is contagious. Try the following one-person loving kindness experiment: Watch this video and notice the feelings, thoughts and sensations that arise. Do you feel like be kinder?